The Blueprint book is an item that can be used to store Blueprints easily, taking up only one inventory space. Blueprints can be used directly from the book item, and the currently active blueprint can be changed with SHIFT+ Mouse wheel up and SHIFT+ Mouse wheel down. Multiple books can be held on one player, and can be named. A blueprint book can be created by clicking the ( ) button in the shortcut bar. 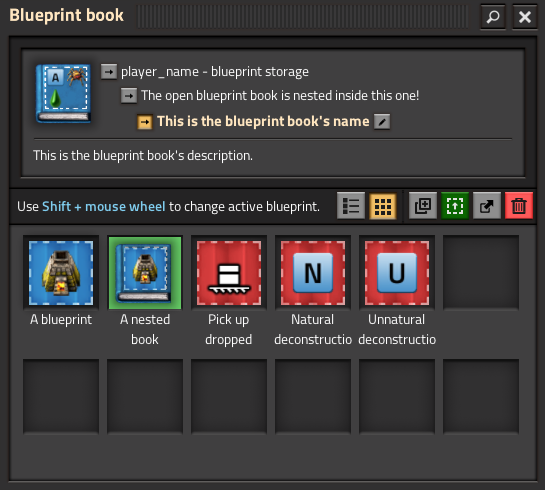 The blueprint book GUI, which can be opened by right clicking the book in the inventory/toolbar. The name of the book can be set with the button next to the label, the red trashcan button allows to delete the blueprint book and the button next to it allows to export the blueprint book by converting it to a string. Blueprint books can be destroyed by clicking the trash can icon in the GUI. Increased blueprint book size to hold 1000 blueprints. Blueprints, blueprint books and deconstruction planners are obtainable from the library GUI with no crafting cost. This page was last edited on 13 April 2019, at 05:41.